Mt. Kearsarge Indian Museum, Education and Cultural Center, is dedicated to connecting people of today with 20,000 years of ongoing Native American cultural expression. The Museum embraces cultural diversity and encourages responsible environmental action based on respect for nature. Through exhibitions and programs, the Museum seeks to challenge and inspire all of us to improve the quality of our lives and our world. 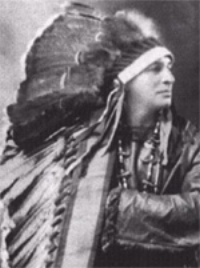 In 1929 Grand Chief Sachem Silverstar visited a second grade classroom and delivered a message that transformed the life of one young boy, Charles “Bud” Thompson. Silverstar emphasized the uniqueness of each individual and their interconnectedness to all other life. He told the children that within each of them was a special power, a talent, that could make the world a better place and that he hoped to someday hear how each and every one of them had made a positive difference. That same year, while on summer vacation at his grandfather’s farm in Connecticut, Bud found an arrowhead and his lifelong love of American Indian artifacts was cemented. The philosophy of Silverstar continues to resonate for Bud and his wife, Nancy, Co-founders of Mt. Kearsarge Indian Museum. The Thompsons were deeply troubled by the harm being done to the environment by greed and apathy. With the help of friends, Bud and Nancy set in motion a plan to create a unique museum, not just a mausoleum of artifacts, but an education and cultural center – a “Museum with a Voice” to pass along Silverstar’s message. The artifacts, instead of being just thingswould inform the study of cultures that understood how to live harmoniously with this land so as to leave it fruitful and beautiful for generations to come. With this in mind, the Museum galleries, grounds and gardens were designed as teaching tools while also functioning as tranquility zones in which visitors would find respite from the hectic pace of modern life. Consider these statistics in the light of Silverstar’s brief visit. In the 20 years since this “dream museum” was founded, more than 250,000 visitors from all over the U.S. and 34 foreign countries have experienced the Museum with a Voice. MKIM is a favorite site for educational school field trips, and hosts over 5,000 school children a year! An inspired teacher, Silverstar has passed away but his message lives on and thousands of lives have been touched by his inspirational philosophy. One man laid out a road map, a clear path to follow; one boy took that message to heart and made it his life’s journey and we are all the better for it. In a triumphant story of reclamation, what is now MKIM’s Medicine Woods Trail, was once an unofficial dump. Coils of barbed wire, a broken manure spreader, an old safe minus its door, a refrigerator, lengths of rope, smashed glass and bald tires once littered what is now a peaceful refuge from the hectic pace of the modern world. This space exists as an educational tool that let’s you step out of the daily grind and reconnect with the Earth. Museum Founders Bud and Nancy Thompson had the vision to see the potential of a beautiful arboretum amidst the refuse. With the help and hard work of friends and volunteers, the vision became a reality. Roger Sanborn, a former MKIM Trustee, brought in a front-end loader and a dump truck to haul off larger items. Smaller pieces were picked up by hand. The Student Conservation Association, headquartered in Charlestown, NH, laid out and mapped the trail and leveled pathways. Bud identified wild plants and set about obtaining non-represented plants used by Native Americans for the site. Generous assistance from Millican Nurseries enables this process even today. Current Board Chairperson, Betsy Janeway orchestrated the securing of a grant to continue trail development. In 2006, our Gardens and Grounds Director, John Brooks, undertook the direction of an ambitious renovation. With grant funding generously awarded by the New Hampshire State Conservation Commission, the trails were widened; leveled significantly, new trails were developed, and new trail covering mulch installed. The result is that the overall accessibility of the Medicine Woods was greatly enhanced, allowing visitors of all ages and abilities to enjoy this jewel. The Medicine Woods was dedicated in June of 1992. John Peters, whose Native name was Slow Turtle, and who was the Supreme Medicine Man of the Mashpee Wampanoag Tribe, presided over the ceremony. His blessing rests lightly over the Medicine Woods to this day. Over the years, plants have thrived or not, based on their adaptability to our climate. Former Board Secretary and current Honorary Trustee Karen Sullivan produced signs while her husband Joseph, an engineer, developed a bridge to arch over the delicate wetland area to preserve it. Bud is often to be found tending the plants, shrubs and trees. His goal is to showcase plants used by Native Peoples for food, medicine, tools and dyes. Today, Museum Educators take groups, including school groups, on tours through the Medicine Woods. MKIM seeks to develop a greater understanding of, and active respect for, the natural world we all share and upon which our survival is dependant. Visitors, and especially children, listen eagerly to descriptions of how plants were used and quickly grasp the idea that humans are part of the sacred circle and have a responsibility to act responsibly as caregivers to the Earth – mother to us all. MKIM’s mission presents the museum’s goal of connecting people to 20,000 years of ongoing Native American cultural expression. In this way, we span a timeframe that reaches back to the roots of this land, long before it was called America or had been “found” by people from Europe. Native North Americans are an original element in the multi-cultural landscape of the United States. Unfortunately, their complex cultures suffered, and continue to suffer, extreme dissipative pressures after the arrival of the Europeans and the founding of our nation. These cultures form a natural treasure – they exist nowhere but here. America has been likened to a “melting pot” but that metaphor implies that all the diverse elements are boiled down into a homogenous state. At the Museum a different metaphor prevails – that of the tapestry. If America is seen as a great weaving, in which unique strands retain their distinctiveness while adding to the beauty of the whole – then Native Americans are the original strand. Their history in this land dates back thousands and thousands of years. Much of the archaeological work done in the state relates to Native American artifacts. Putting the science of archaeology in New Hampshire into a Native American context is one of MKIM’s goals. In this we have had the invaluable assistance of several key individuals. Howard Sargent, a Founding Trustee, and seminal figure in New Hampshire archaeology was a key advisor to the Thompson’s as their dream museum took shape. In addition, he created the large mural map of the continent that graces our lobby. This map, unfortunately incomplete at the time of Sargent’s death, vividly illustrates the range of Native habitation – coast to coast, north to south. Below it is a case containing archaeological artifacts found in New Hampshire including an excellent example of a prehistoric Woodland ceramic vessel as well as lithic implements such as stone axes. As a member of MKIM’s Collections Committee, State Archaeologist Richard Boisvert, helps assess collecting priorities and renovation proposals that impact MKIM’s collections. His office works with MKIM in presenting Project Archaeology trainings that highlight the importance of the land we call New Hampshire. We are grateful to all those who have helped MKIM in its mission to educate visitors about the full scope of Native expression.